Connecticut College’s Music in the Meadow returns Sunday, June 18 at 4pm in the Arboretum’s outdoor theater by the pond. 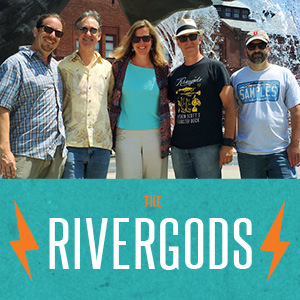 The sixth concert in this series boasts another stellar line-up of the region’s finest roots rock/Americana music: The Rivergods (https://therivergods.com/), who’s latest full-length release State of the Union is garnering great reviews, the rhythmic folk rock of Boston’s Black Marmot (https://www.facebook.com/blackmarmot/) and the warm, melodic musings of Westerly, RI’s Wild Sun (http://wildsunusa.com/). Bring your lawn chairs and blankets for an enjoyable, family-friendly outdoor concert! B.Y.O.P. (Picnic, etc.! ), or enjoy some food from our on-hand food truck! Gates open at 4pm, adult tickets are $10, kids $5. The Rivergods are excited to make our debut at one New London’s hottest new nightspots… The Social Bar & Kitchen! Kick the summer off right with us Saturday, May 27. Great food, great music and 50 (50!!!) beers on tap. We’ll play a few sets starting at 8pm…. see you there! More info here.